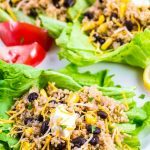 If you want a quinoa recipe to taste good or perhaps you’re craving a healthier version of Taco’s, then these quinoa lettuce bowls are tasty creations to try! I’m not really a quinoa fan but if you can get it to taste good why not give these healthy grains a try. To incorporate some more tasty grains into your life I advise you to try this shrimp couscous salad. But if you couldn’t get yourself to like quinoa this recipe is one to try. The Mexican inspired flavors work so well here and served over a bed of lettuce and some sour cream–just YUM! Serving this is so versatile and can make a great make ahead meal. Eat it hot or cold, pile it over some shredded greens to make a quick salad or serve on a bed of lettuce for an appealing look (my daughter even commenting these look like there from the restaurant.) Give these a try! 1. In a medium saucepan sauté onion & garlic in 1 teaspoon of olive oil. Add the quinoa, broth, spices and bring to a boil; reduce the heat to low, cover and simmer 20 minutes. 3. Serve over lettuce and top with a dollop of sour cream. Garnish with cilantro and shredded cheese if desired. If you want a quinoa recipe to taste good or perhaps you're craving a healthier version of Taco's, then these quinoa lettuce bowls are tasty creations to try! In a medium saucepan sauté onion & garlic in 1 teaspoon of olive oil. Add the quinoa, broth, spices and bring to a boil; reduce the heat to low, cover and simmer 20 minutes. Serve over lettuce and top with a dollop of sour cream. Garnish with cilantro and shredded cheese if desired.